The message board for all our playmobil® discussions. Join us there! from our very own Countess Krystal, the best playmophotostories around! The place to go for animal info, featuring just about ALL playmoanimals that EVER were. Great fan/collector site - though not updated in a long time. 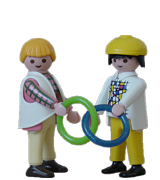 A site on the subject, using playmobil® figures. With tons of photos of customized little people, and information on how to do it. Loads of playmo-related material... including cakes! 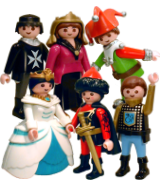 Loads of playmobil items pictured - and also those playmo-wannabes, Play Big. Featuring a photo-story in several languages! This site has GORGEOUS customs and a casting tutorial!